Download "Module 1. Introduction. 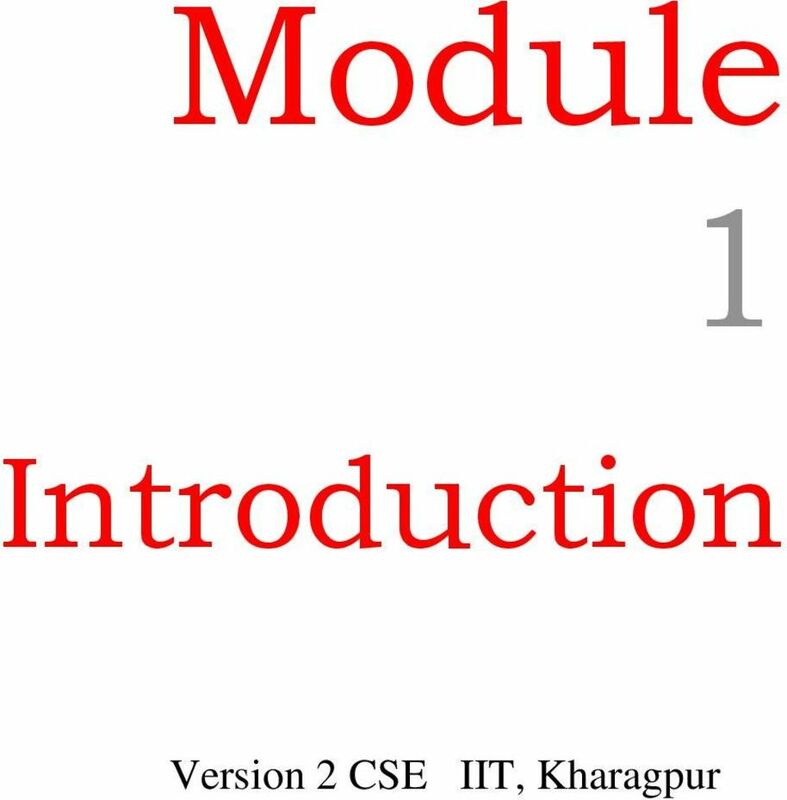 Version 2 CSE IIT, Kharagpur"
3 Specific Functional Objectives On Completion of this lesson, the students will be able to: State the requirement for layered approach Explain the basic concept of layering in the network model Define entities protocols in networking context Describe ISO s OSI Reference Model Explain information flow in OSI references Model. 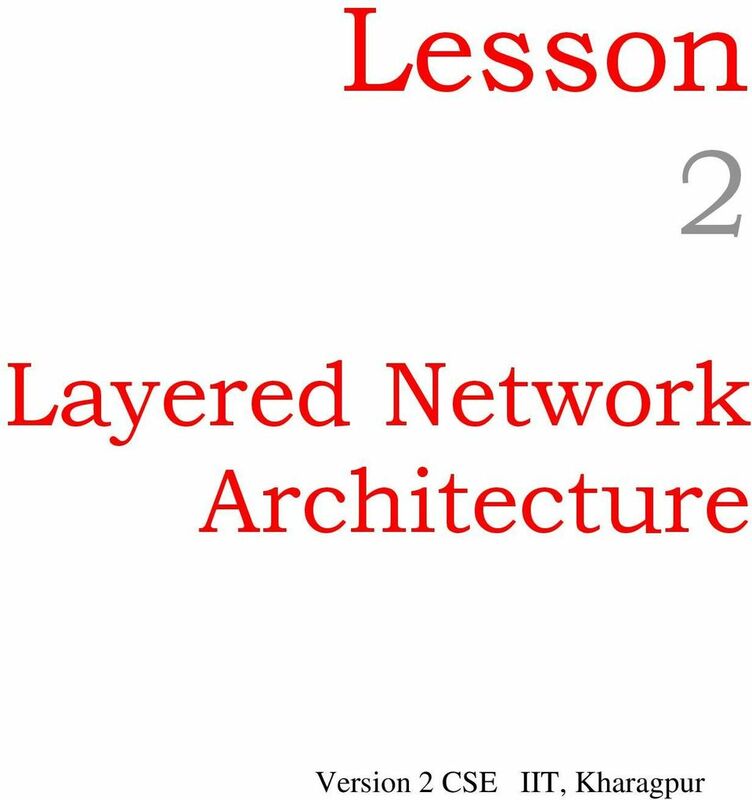 Explain functions of the seven layers of OSI Model Basic concept of layering Network architectures define the standards and techniques for designing and building communication systems for computers and other devices. In the past, vendors developed their own architectures and required that other vendors conform to this architecture if they wanted to develop compatible hardware and software. There are proprietary network architectures such as IBM's SNA (Systems Network Architecture) and there are open architectures like the OSI (Open Systems Interconnection) model defined by the International Organization for Standardization. The previous strategy, where the computer network is designed with the hardware as the main concern and software is afterthought, no longer works. Network software is now highly structured. To reduce the design complexity, most of the networks are organized as a series of layers or levels, each one build upon one below it. The basic idea of a layered architecture is to divide the design into small pieces. Each layer adds to the services provided by the lower layers in such a manner that the highest layer is provided a full set of services to manage communications and run the applications. The benefits of the layered models are modularity and clear interfaces, i.e. open architecture and comparability between the different providers' components. A basic principle is to ensure independence of layers by defining services provided by each layer to the next higher layer without defining how the services are to be performed. This permits changes in a layer without affecting other layers. Prior to the use of layered protocol architectures, simple changes such as adding one terminal type to the list of those supported by an architecture often required changes to essentially all communications software at a site. The number of layers, functions and contents of each layer differ from network to network. However in all networks, the purpose of each layer is to offer certain services to higher layers, shielding those layers from the details of how the services are actually implemented. The basic elements of a layered model are services, protocols and interfaces. 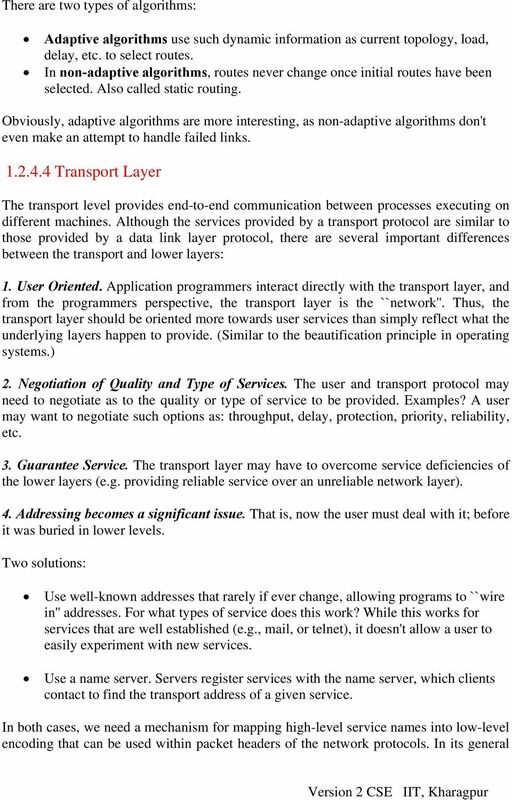 A service is a set of actions that a layer offers to another (higher) layer. Protocol is a set of rules that a layer uses to exchange information with a peer entity. These rules concern both the contents and the order of the messages used. Between the layers service interfaces are defined. The messages from one layer to another are sent through those interfaces. 4 In an n-layer architecture, layer n on one machine carries on conversation with the layer n on other machine. The rules and conventions used in this conversation are collectively known as the layer-n protocol. Basically, a protocol is an agreement between the communicating parties on how communication is to proceed. Violating the protocol will make communication more difficult, if not impossible. A five-layer architecture is shown in Fig , the entities comprising the corresponding layers on different machines are called peers. In other words, it is the peers that communicate using protocols. In reality, no data is transferred from layer n on one machine to layer n of another machine. Instead, each layer passes data and control information to the layer immediately below it, until the lowest layer is reached. 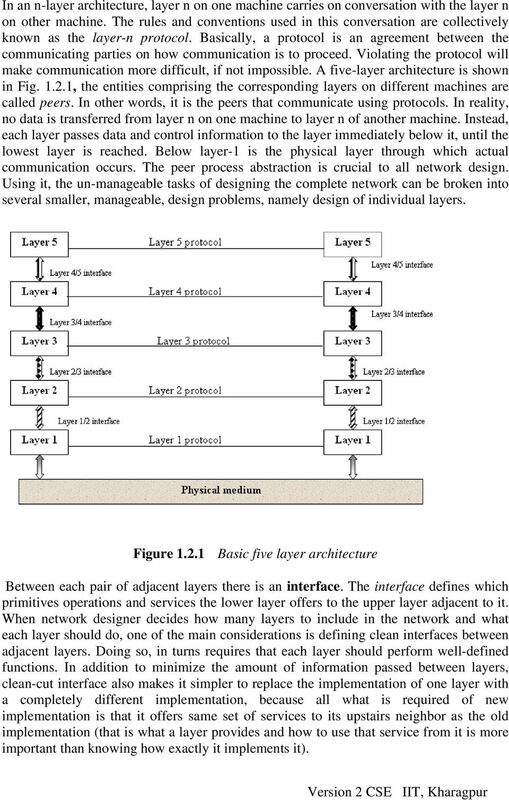 Below layer-1 is the physical layer through which actual communication occurs. The peer process abstraction is crucial to all network design. Using it, the un-manageable tasks of designing the complete network can be broken into several smaller, manageable, design problems, namely design of individual layers. Figure Basic five layer architecture Between each pair of adjacent layers there is an interface. The interface defines which primitives operations and services the lower layer offers to the upper layer adjacent to it. When network designer decides how many layers to include in the network and what each layer should do, one of the main considerations is defining clean interfaces between adjacent layers. Doing so, in turns requires that each layer should perform well-defined functions. In addition to minimize the amount of information passed between layers, clean-cut interface also makes it simpler to replace the implementation of one layer with a completely different implementation, because all what is required of new implementation is that it offers same set of services to its upstairs neighbor as the old implementation (that is what a layer provides and how to use that service from it is more important than knowing how exactly it implements it). 5 A set of layers and protocols is known as network architecture. The specification of architecture must contain enough information to allow an implementation to write the program or build the hardware for each layer so that it will correctly obey the appropriate protocol. Neither the details of implementation nor the specification of interface is a part of network architecture because these are hidden away inside machines and not visible from outside. It is not even necessary that the interface on all machines in a network be same, provided that each machine can correctly use all protocols. A list of protocols used by a certain system, one protocol per layer, is called protocol stack. 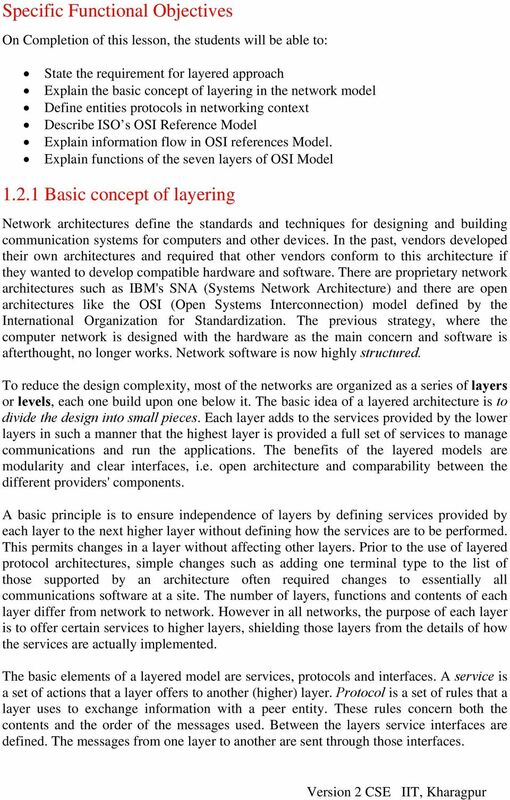 Summary: Why Layered architecture? 1. To make the design process easy by breaking unmanageable tasks into several smaller and manageable tasks (by divide-and-conquer approach). 2. Modularity and clear interfaces, so as to provide comparability between the different providers' components. 3. Ensure independence of layers, so that implementation of each layer can be changed or modified without affecting other layers. 4. Each layer can be analyzed and tested independently of all other layers Open System Interconnection Reference Model The Open System Interconnection (OSI) reference model describes how information from a software application in one computer moves through a network medium to a software application in another computer. 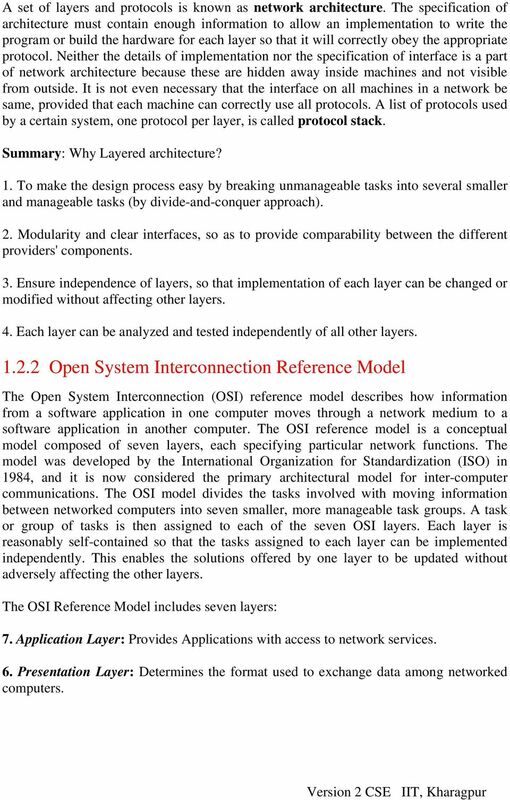 The OSI reference model is a conceptual model composed of seven layers, each specifying particular network functions. The model was developed by the International Organization for Standardization (ISO) in 1984, and it is now considered the primary architectural model for inter-computer communications. The OSI model divides the tasks involved with moving information between networked computers into seven smaller, more manageable task groups. A task or group of tasks is then assigned to each of the seven OSI layers. Each layer is reasonably self-contained so that the tasks assigned to each layer can be implemented independently. This enables the solutions offered by one layer to be updated without adversely affecting the other layers. 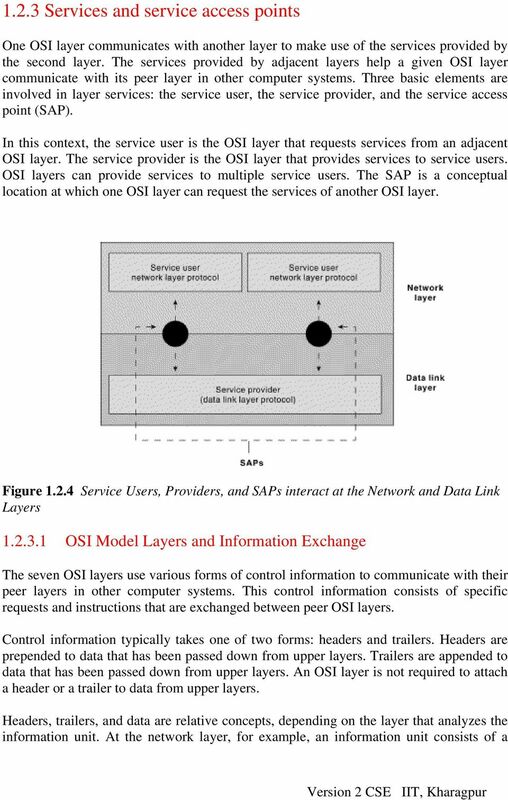 The OSI Reference Model includes seven layers: 7. Application Layer: Provides Applications with access to network services. 6. 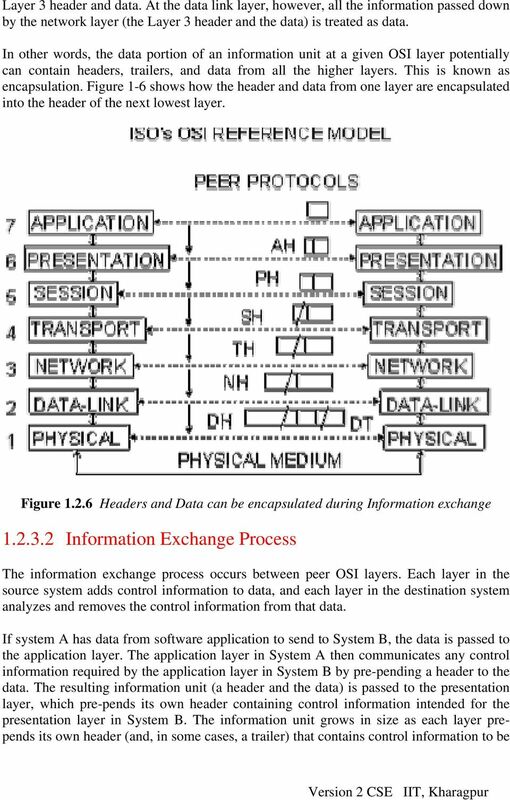 Presentation Layer: Determines the format used to exchange data among networked computers. 6 5. Session Layer: Allows two applications to establish, use and disconnect a connection between them called a session. Provides for name recognition and additional functions like security, which are needed to allow applications to communicate over the network. 4. Transport Layer: Ensures that data is delivered error free, in sequence and with no loss, duplications or corruption. This layer also repackages data by assembling long messages into lots of smaller messages for sending, and repackaging the smaller messages into the original larger message at the receiving end. 3. 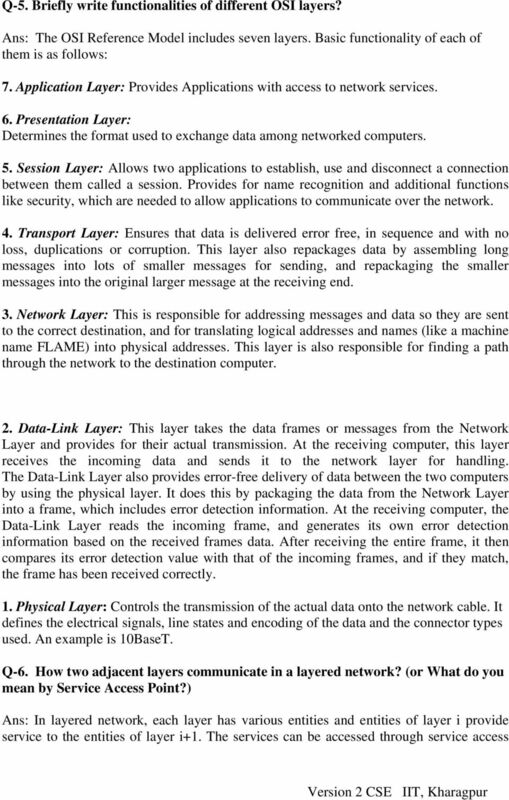 Network Layer: This is responsible for addressing messages and data so they are sent to the correct destination, and for translating logical addresses and names (like a machine name FLAME) into physical addresses. This layer is also responsible for finding a path through the network to the destination computer. 2. Data-Link Layer: This layer takes the data frames or messages from the Network Layer and provides for their actual transmission. At the receiving computer, this layer receives the incoming data and sends it to the network layer for handling. The Data-Link Layer also provides error-free delivery of data between the two computers by using the physical layer. It does this by packaging the data from the Network Layer into a frame, which includes error detection information. At the receiving computer, the Data-Link Layer reads the incoming frame, and generates its own error detection information based on the received frames data. After receiving the entire frame, it then compares its error detection value with that of the incoming frames, and if they match, the frame has been received correctly. 1. Physical Layer: Controls the transmission of the actual data onto the network cable. It defines the electrical signals, line states and encoding of the data and the connector types used. 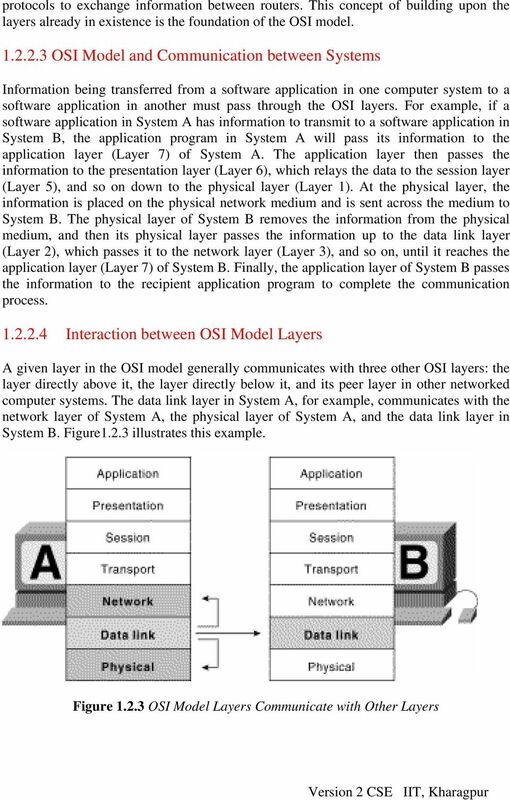 An example is 10BaseT Characteristics of the OSI Layers The seven layers of the OSI reference model can be divided into two categories: upper layers and lower layers as shown in Fig The upper layers of the OSI model deal with application issues and generally are implemented only in software. The highest layer, the application layer, is closest to the end user. Both users and application layer processes interact with software applications that contain a communications component. The term upper layer is sometimes used to refer to any layer above another layer in the OSI model. The lower layers of the OSI model handle data transport issues. The physical layer and the data link layer are implemented in hardware and software. The lowest layer, the physical layer, is closest to the physical network medium (the network cabling, for example) and is responsible for actually placing information on the medium. 11 used by its peer layer in System B. At the physical layer, the entire information unit is placed onto the network medium. 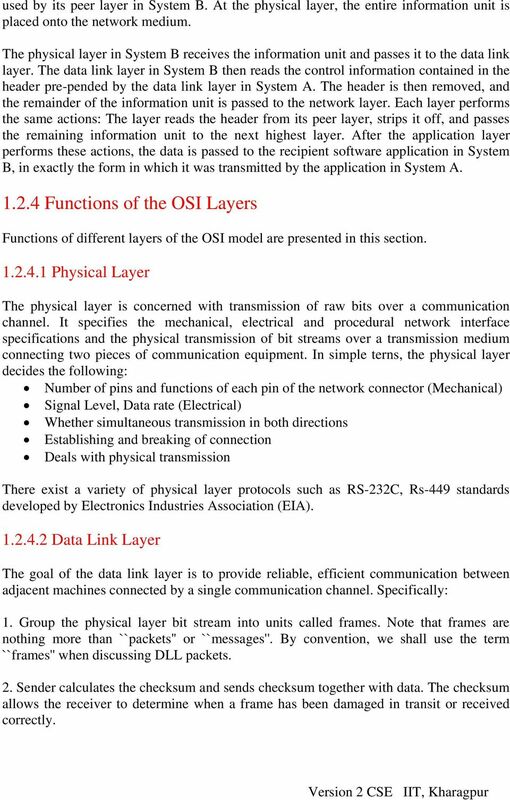 The physical layer in System B receives the information unit and passes it to the data link layer. The data link layer in System B then reads the control information contained in the header pre-pended by the data link layer in System A. The header is then removed, and the remainder of the information unit is passed to the network layer. Each layer performs the same actions: The layer reads the header from its peer layer, strips it off, and passes the remaining information unit to the next highest layer. 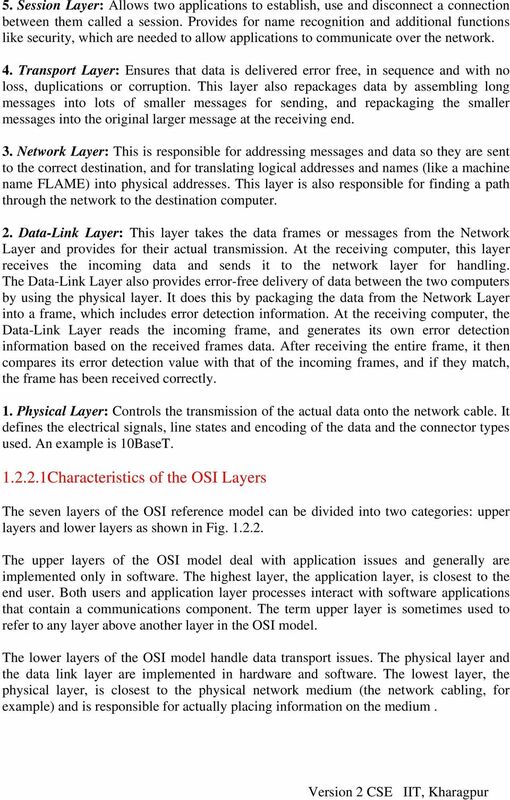 After the application layer performs these actions, the data is passed to the recipient software application in System B, in exactly the form in which it was transmitted by the application in System A Functions of the OSI Layers Functions of different layers of the OSI model are presented in this section Physical Layer The physical layer is concerned with transmission of raw bits over a communication channel. It specifies the mechanical, electrical and procedural network interface specifications and the physical transmission of bit streams over a transmission medium connecting two pieces of communication equipment. In simple terns, the physical layer decides the following: Number of pins and functions of each pin of the network connector (Mechanical) Signal Level, Data rate (Electrical) Whether simultaneous transmission in both directions Establishing and breaking of connection Deals with physical transmission There exist a variety of physical layer protocols such as RS-232C, Rs-449 standards developed by Electronics Industries Association (EIA) Data Link Layer The goal of the data link layer is to provide reliable, efficient communication between adjacent machines connected by a single communication channel. Specifically: 1. Group the physical layer bit stream into units called frames. Note that frames are nothing more than ``packets'' or ``messages''. By convention, we shall use the term ``frames'' when discussing DLL packets. 2. Sender calculates the checksum and sends checksum together with data. The checksum allows the receiver to determine when a frame has been damaged in transit or received correctly. 13 which they arrive, regardless of the original sending order. Typically, each frame is assigned a unique sequence number, which the receiver returns in an acknowledgment frame to indicate which frame the ACK refers to. The sender must retransmit unacknowledged (e.g., lost or damaged) frames. d). Framing The DLL translates the physical layer's raw bit stream into discrete units (messages) called frames. 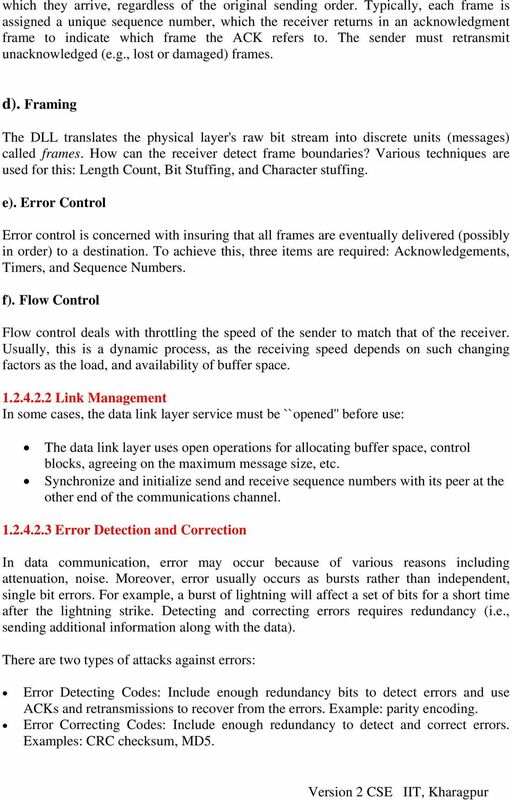 How can the receiver detect frame boundaries? Various techniques are used for this: Length Count, Bit Stuffing, and Character stuffing. e). Error Control Error control is concerned with insuring that all frames are eventually delivered (possibly in order) to a destination. To achieve this, three items are required: Acknowledgements, Timers, and Sequence Numbers. f). Flow Control Flow control deals with throttling the speed of the sender to match that of the receiver. Usually, this is a dynamic process, as the receiving speed depends on such changing factors as the load, and availability of buffer space Link Management In some cases, the data link layer service must be ``opened'' before use: The data link layer uses open operations for allocating buffer space, control blocks, agreeing on the maximum message size, etc. Synchronize and initialize send and receive sequence numbers with its peer at the other end of the communications channel Error Detection and Correction In data communication, error may occur because of various reasons including attenuation, noise. Moreover, error usually occurs as bursts rather than independent, single bit errors. For example, a burst of lightning will affect a set of bits for a short time after the lightning strike. Detecting and correcting errors requires redundancy (i.e., sending additional information along with the data). There are two types of attacks against errors: Error Detecting Codes: Include enough redundancy bits to detect errors and use ACKs and retransmissions to recover from the errors. Example: parity encoding. Error Correcting Codes: Include enough redundancy to detect and correct errors. Examples: CRC checksum, MD5. 14 Network Layer The basic purpose of the network layer is to provide an end-to-end communication capability in contrast to machine-to-machine communication provided by the data link layer. This end-to-end is performed using two basic approaches known as connectionoriented or connectionless network-layer services Four issues: 1. Interface between the host and the network (the network layer is typically the boundary between the host and subnet) 2. Routing 3. Congestion and deadlock 4. Internetworking (A path may traverse different network technologies (e.g., Ethernet, point-to-point links, etc.) Network Layer Interface There are two basic approaches used for sending packets, which is a group of bits that includes data plus source and destination addresses, from node to node called virtual circuit and datagram methods. These are also referred to as connection-oriented and connectionless network-layer services. In virtual circuit approach, a route, which consists of logical connection, is first established between two users. During this establishment phase, the two users not only agree to set up a connection between them but also decide upon the quality of service to be associated with the connection. The well-known virtualcircuit protocol is the ISO and CCITT X.25 specification. The datagram is a selfcontained message unit, which contains sufficient information for routing from the source node to the destination node without dependence on previous message interchanges between them. In contrast to the virtual-circuit method, where a fixed path is explicitly set up before message transmission, sequentially transmitted messages can follow completely different paths. 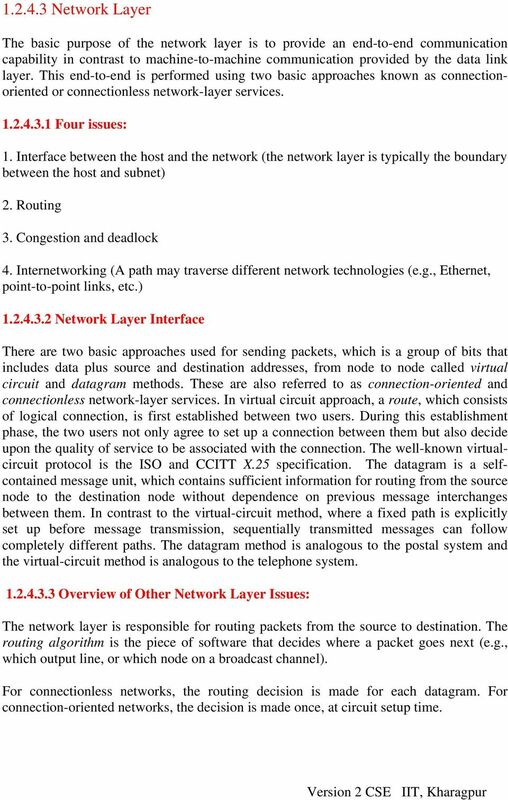 The datagram method is analogous to the postal system and the virtual-circuit method is analogous to the telephone system Overview of Other Network Layer Issues: The network layer is responsible for routing packets from the source to destination. The routing algorithm is the piece of software that decides where a packet goes next (e.g., which output line, or which node on a broadcast channel). For connectionless networks, the routing decision is made for each datagram. For connection-oriented networks, the decision is made once, at circuit setup time. 15 Routing Issues: The routing algorithm must deal with the following issues: Correctness and simplicity: networks are never taken down; individual parts (e.g., links, routers) may fail, but the whole network should not. Stability: if a link or router fails, how much time elapses before the remaining routers recognize the topology change? (Some never do.) Fairness and optimality: an inherently intractable problem. Definition of optimality usually doesn't consider fairness. Do we want to maximize channel usage? Minimize average delay? 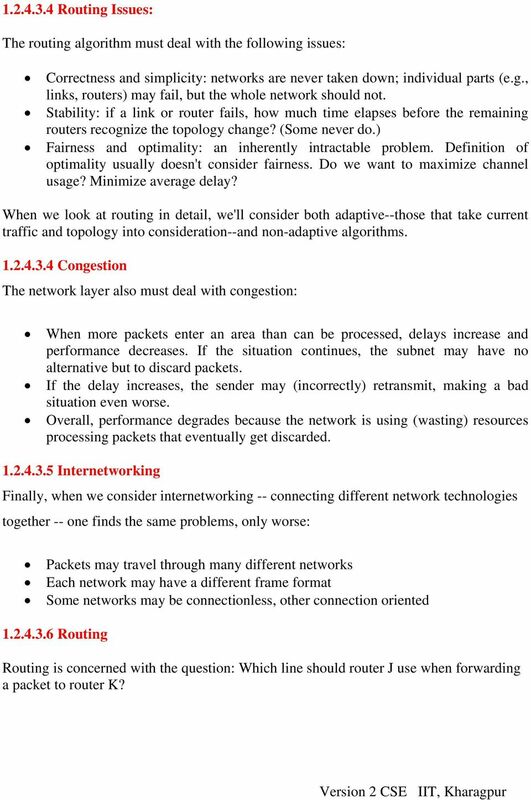 When we look at routing in detail, we'll consider both adaptive--those that take current traffic and topology into consideration--and non-adaptive algorithms Congestion The network layer also must deal with congestion: When more packets enter an area than can be processed, delays increase and performance decreases. If the situation continues, the subnet may have no alternative but to discard packets. If the delay increases, the sender may (incorrectly) retransmit, making a bad situation even worse. Overall, performance degrades because the network is using (wasting) resources processing packets that eventually get discarded Internetworking Finally, when we consider internetworking -- connecting different network technologies together -- one finds the same problems, only worse: Packets may travel through many different networks Each network may have a different frame format Some networks may be connectionless, other connection oriented Routing Routing is concerned with the question: Which line should router J use when forwarding a packet to router K? 18 sharing machine or to transfer a file between two machines. Some of the session related services are: 1. This layer manages Dialogue Control. Session can allow traffic to go in both direction at the same time, or in only one direction at one time. 2. Token management. For some protocols, it is required that both sides don't attempt same operation at the same time. To manage these activities, the session layer provides tokens that can be exchanged. Only one side that is holding token can perform the critical operation. This concept can be seen as entering into a critical section in operating system using semaphores. 3. Synchronization. Consider the problem that might occur when trying to transfer a 4- hour file transfer with a 2-hour mean time between crashes. After each transfer was aborted, the whole transfer has to start again and again would probably fail. To Eliminate this problem, Session layer provides a way to insert checkpoints into data streams, so that after a crash, only the data transferred after the last checkpoint have to be repeated Presentation Layer This layer is concerned with Syntax and Semantics of the information transmitted, unlike other layers, which are interested in moving data reliably from one machine to other. Few of the services that Presentation layer provides are: 1. Encoding data in a standard agreed upon way. 2. It manages the abstract data structures and converts from representation used inside computer to network standard representation and back Application Layer The application layer consists of what most users think of as programs. The application does the actual work at hand. Although each application is different, some applications are so useful that they have become standardized. The Internet has defined standards for: File transfer (FTP): Connect to a remote machine and send or fetch an arbitrary file. FTP deals with authentication, listing a directory contents, ASCII or binary files, etc. Remote login (telnet): A remote terminal protocol that allows a user at one site to establish a TCP connection to another site, and then pass keystrokes from the local host to the remote host. Mail (SMTP): Allow a mail delivery agent on a local machine to connect to a mail delivery agent on a remote machine and deliver mail. News (NNTP): Allows communication between a news server and a news client. Web (HTTP): Base protocol for communication on the World Wide Web. 21 point (SAP), which has some address through which the layer i+1 will access the services provided by layer i. Q-7. What are the key functions of data link layer? 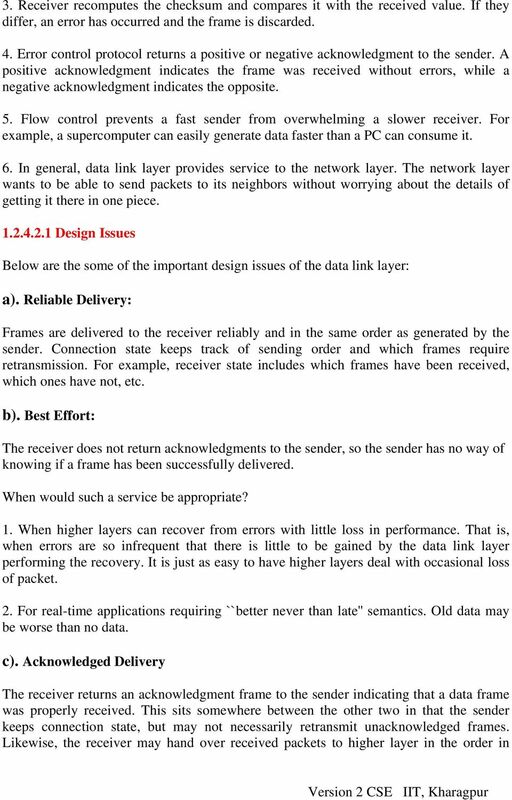 Ans: Data link layer transfers data in a structured and reliable manner so that the service provided by the physical layer is utilized by data link layer. Main function of data link layer is framing and media access control. Q8. What do you mean by Protocol? Ans: In the context of data networking, a protocol is a formal set of rules and conventions that governs how computers exchange information over a network medium. A protocol implements the functions of one or more of the OSI layers. 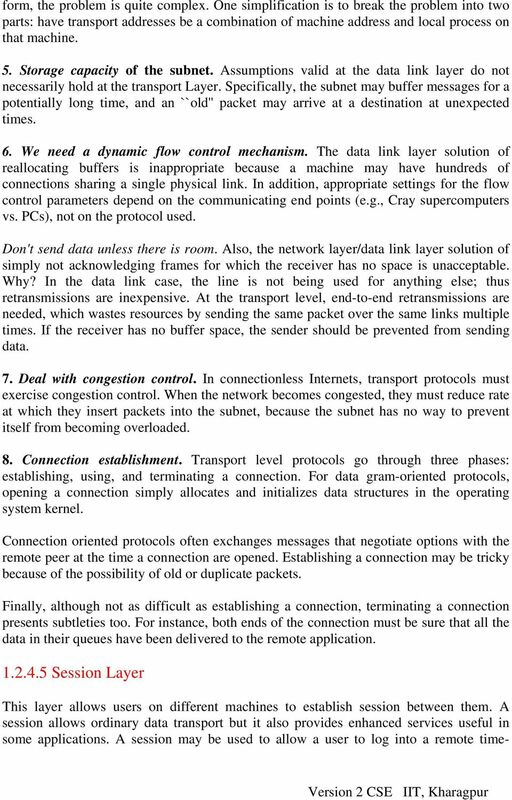 Protocols and Architecture. Protocol Architecture. 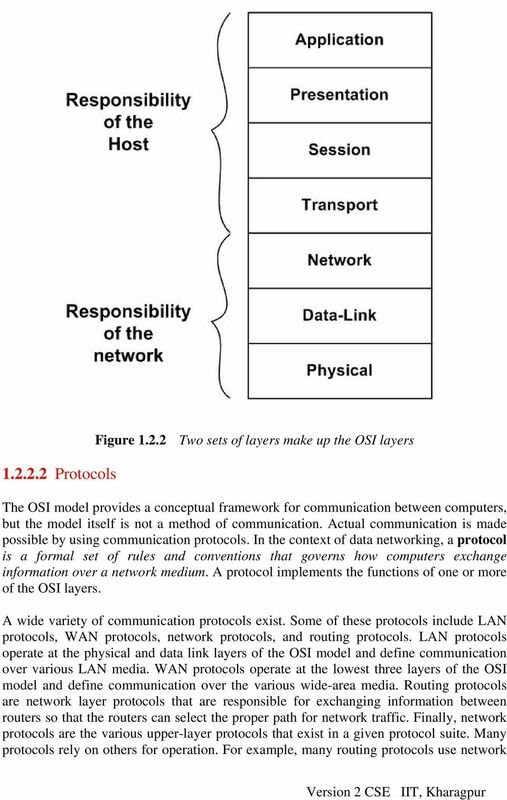 1 Network Reference Models - OSI Reference Model - A computer network connects two or more devices together to share information and services. Multiple networks connected together form an internetwork. 1. The subnet must prevent additional packets from entering the congested region until those already present can be processed. Networking Test 4 Study Guide True/False Indicate whether the statement is true or false. 1. IPX/SPX is considered the protocol suite of the Internet, and it is the most widely used protocol suite in LANs. 1 Introduction to mobile telecommunications Mobile phones were first introduced in the early 1980s. In the succeeding years, the underlying technology has gone through three phases, known as generations. Internet Concepts. What is a Network? Requirements of Voice in an IP Internetwork Real-Time Voice in a Best-Effort IP Internetwork This topic lists problems associated with implementation of real-time voice traffic in a best-effort IP internetwork. What is CSG150 about? Fundamentals of Computer Networking. Course Outline. Lecture 1 Outline. Guevara Noubir noubir@ccs.neu. Overview of Network Hardware and Software. CS158a Chris Pollett Jan 29, 2007. A PPENDIX L TCP/IP and OSI William Stallings Copyright 2010 L.1 PROTOCOLS AND PROTOCOL ARCHITECTURES...2! L.2 THE TCP/IP PROTOCOL ARCHITECTURE...5! TCP/IP Layers...5! TCP and UDP...7! Operation of TCP/IP...7!